As Directress of Physical Education, Applebee centralized everything related to student health and athletic activities under her control, including outdoor competitive sports. The underlying philosophy of Applebee and other physical educators at the time was largely similar to what had caused Bryn Mawr College to institute a physical education in the first place - the belief that good health required regular and regulated physical activity. Students could not be trusted to participate in competitive athletics without the instruction of a professional physical educator. Like her predecessors, Applebee kept careful track of the students' measurements and whether their health improved or not. She made herself responsible for providing and enforcing training rules for athletic teams, which previously had been the responsibility of team captains. 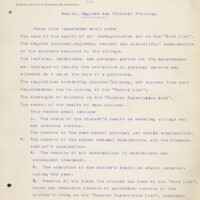 In her report for the school year 1906-1907, Applebee presented a revised set of rules. One change was the institution of fines for missed gym periods; the proceeds were used to purchase gymnastic equipment, and every year Applebee was able to report an appreciable sum from fines collected. The new system was successful and does not seem to have encountered significant resistance from students, and was maintained without change for the rest of Applebee's tenure as director. The modification in regard to the committee would not have been at all in accordance with my ideas for a health department, which were formed on the modern method of the care of the health of communities, on an absolutely professional and expert basis ... While I think such a committee should consult and meet with the Wardens, and would get much valuable advice from them, the alteration you suggest would entirely change the committee from a professional to an amateur one1. I have personally experienced with President Thomas the heartiest cooperation in everything that furthured the highest interests of the students. In regard to difference of opinion on questions that have dealt directly with my own work, I have again and again found President Thomas open to argument and willing to allow me, whenever possible, to act on my own judgment ... Further may I say that my chief reasons for renewing my contract with Bryn Mawr from time to time have been the above facts and the high standard of integrity and work, even in so minor a matter as physical training, demanded and made possible by President Thomas' administration2. 1. Applebee, Constance. "Letter to M. Carey Thomas, April 30, 1909." Folder 4, Box 5, Constance Applebee Papers, Special Collections Department, Bryn Mawr College Library. 2. Applebee, Constance. "Letter to Miss Kirkbride, May 12, 1916." 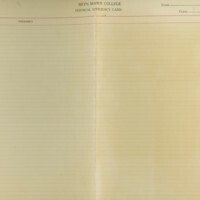 Folder 2, Box 5, Constance Applebee Papers, Special Collections Department, Bryn Mawr College Library. 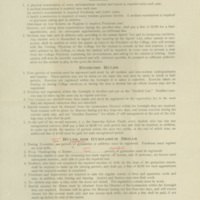 The Health Committee, established in 1909, created comprehensive rules governing exercise and athletic participation. Students on the Sports List were restricted, based on their physical examination, in what forms of physical activity they could participate in. 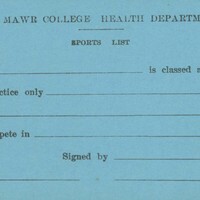 Records were kept of every student's health and athletic ability. This document outlines the responsibilities and functions of the Health Department.